Like many others out there, I have an up and down relationship with Once Upon A Time. One second I hate it, the next second I'm crying hysterically over the death of Neal in what is now typical Matthew Crawley style. OK, I guess right now I am obsessed with OUAT. Know what I'm not obsessed with? Frozen. Sure, as I write this a giant stuffed Olaf stares back at me (he was just too cute not to buy, okay? ), but I by no means have plans to get lyrics from "Let It Go" tattooed on me anywhere. Whether I like it or not, Frozen is coming to Once Upon A Time Season 4, which is very soon — Sept. 28 soon. I'm just trying to make as much peace with it as I can before its arrival. Once upon a time, it took me soooo long to come around to the fact that even though they don't have a baby in the classic Disney movie, Snow White and Prince Charming have a baby on OUAT, and she's an adult in the real world, and she's the "savior," which is not a meet and greet character at Disney World. Fine, okay, OUAT, I'll buy what you're selling. It took me three seasons to settle into this groove with the show where I could accept that these were different characters than the ones in the movies. Even when the characters were veering far off their Disney movie course, they still had the character's same essence. I saw Mulan fightin' the bad guys, just like in her movie, but she was like, Mulan, with a twist! Then, Frozen happened. The OUAT Elsa does not look like Elsa, with a twist! She just looks like regular Elsa. Let's talk about Belle for a second, because I think Belle is one of the most complex and fascinating characters on the show. Disney movie Belle is a young girl living in France who dreams of adventure in the great wide somewhere. She has a big heart and is able to look past outward appearances to see the good inside of people. She falls in love with a literal beast, and their true love ultimately saves him. OUAT Belle is kind of the same; she's adventurous, she sees the good in people, and she falls in love with a different kind of beast, Rumpelstiltskin. Belle loves books, so naturally she's in charge of the town library. I can accept that she's a new version of Belle, because she's still staying true to the original character. Belle's essence is kindness and books. She's Belle, with a twist! From all the promos and images we've seen of Elsa on Once, she is the same exact Elsa from the movie. Booooring. Elsa is wearing the same dress she wears in Frozen. Elsa has her long hair braided the same way she does in Frozen. When Elsa walks she leaves a trail of ice behind her, just like she does in Frozen. Remember at the end of OUAT Season 3 when she takes off her glove and shoots her icy power out of her hand just like she does in Frozen? It's easy to differentiate between movie Belle and TV Belle, because they are different characters. Movie Elsa and TV Elsa seem to be one and the same. Fearless showrunners, Edward Kitsis and Adam Horowitz, remind us again and again that they've created different characters for OUAT, which is why they deprived us of casting Kristen Bell. They want their show to "stand alone." Yet, they say that and then the show's season premiere logline reads like a sequel to Frozen. Plus, Sven is present. So are those damn trolls. It's not shaping up to be Frozen, with a twist! But rather, Frozen: The TV Edition. What I hated in the beginning of OUAT is now what I love about the show. You mean Peter Pan is Evil? Mulan is in love with Aurora?? The Evil Queen's soulmate is Robin Hood??? I'm constantly on the edge of my seat trying to figure out what they're going to do next, and who they're going to introduce next. Right from the get go they've taken the creative liberty to re-write all the stories for these characters. 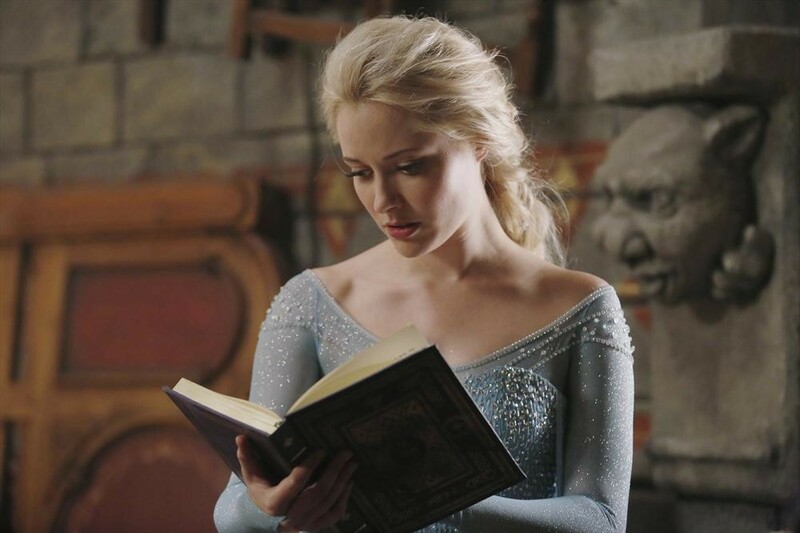 I look at the released pictures of OUAT Elsa and just think, "yup, that's Elsa." She appears to have no twisted backstory, no tricks up her sleeve, just a lot of ice and snow and a sparkly blue dress. There's a quick clip in the new promo for Season 4 that shows Elsa and Anna standing in front of their parents' grave site. Just like in the movie. We've got to pump the brakes a little bit with this Frozen over-play, because I want to see something different. You can give me Kristoff, but don't give me ice salesman Kristoff. Give me used car salesman Kristoff. I want to see Elsa working in a cold-related profession, like in a meat locker or as an ice fisherman. What about one of those Ice Bars?? She'd still hold the same essence of the character, but she'd be different. She'd be a OUAT version of herself. She'd be Elsa, but with a twist.